How does your tournament finish affect your spirit score? This article was written by Jonah Boucher. Spirit scores are, at best, a fuzzy placeholder for sportsmanship and fair play and, at worst, all 2s because the spirit captain fills them out hurriedly at the end of each game. The fact that the elite teams in the sport rank one another’s spirit at all, though, provides a unique chance to see where the nice really finish. 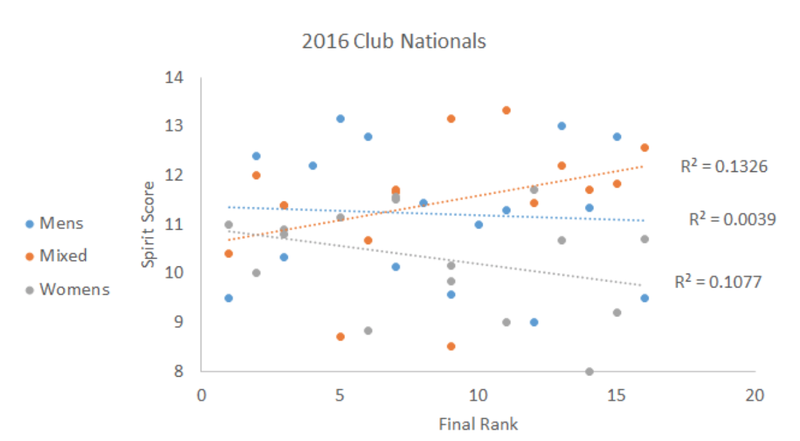 With a little digging and reformatting, the Club Nationals final standings and spirit score standings are available from USA Ultimate. 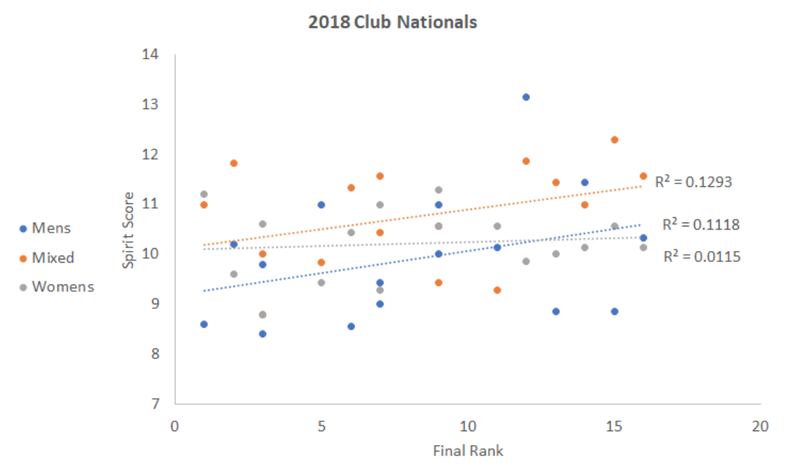 Teams’ average spirit scores (from a low of 0 to a high of 20) can be plotted against their finish (1st to 16th) to provide a rough idea of how the spirit scores of teams that did well compare to those of teams who did poorly. 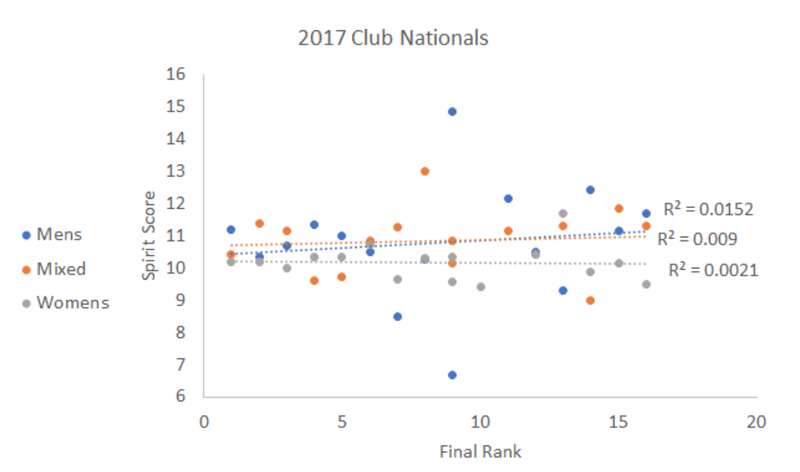 At the most recent Club Nationals in San Diego, the correlation between final rank and spirit score depended on the division. 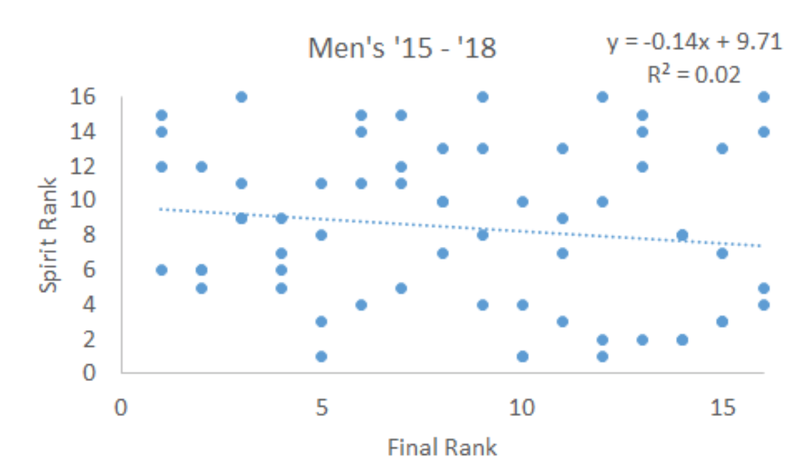 The positive slopes of the trendlines for Men’s and Mixed indicated that teams that did poorly were more likely to get better spirit scores. However, there was almost no relationship between final rank and spirit scores for the Women’s Division. Looking at a combined sample of all four years requires a slight shift in perspective because of how variable spirit scores are from year to year. 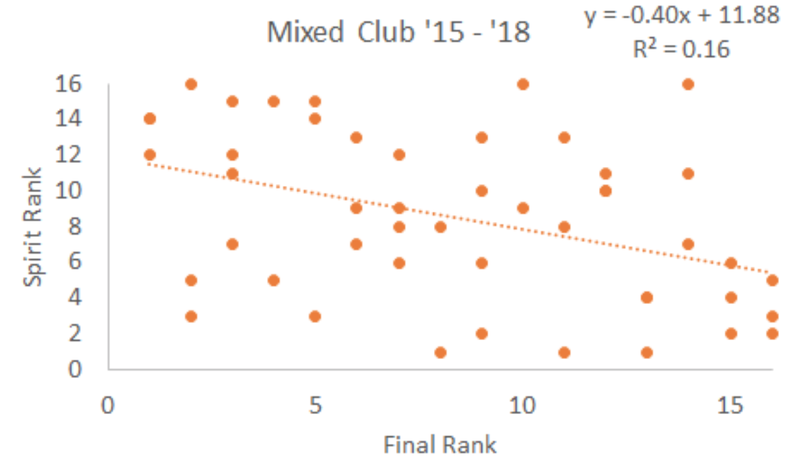 The average spirit score across all three divisions in 2015 was 11.97 vs. 10.30 in 2018 (likely due to a changing application of spirit guidelines rather than to deteriorating spirit). Instead of comparing spirit scores themselves, we can instead just compare the final rank of a team to the “spirit rank” of the team. A spirit rank of 1 means that that team had the highest spirit score in their division. The bottom left corner of the following graphs is where successful, spirited teams end up. 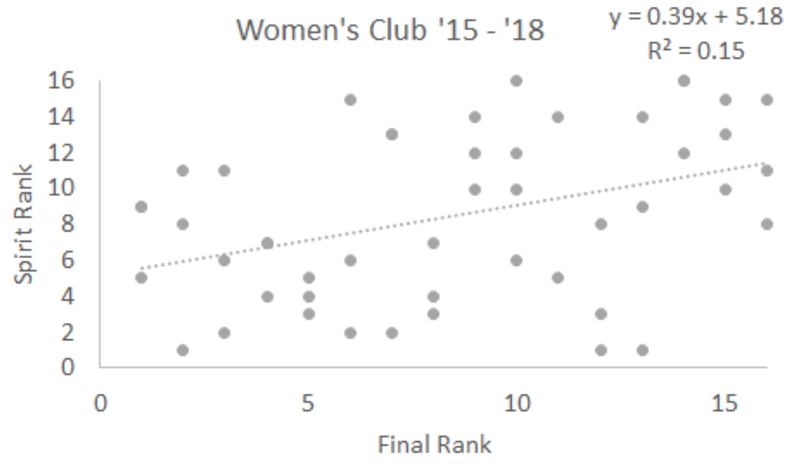 The top right corner is where a team like 2015 Florida United sits for finishing last in the rankings and last in spirit. The trends, of course, are just that. There is little to be learned about how to either improve your spirit scores by changing your performance or vice versa. The inter-divisional differences may speak to the very different competitive landscapes, but that too may be grasping at straws. Plenty of confounding factors such as anomalous chippy games or a series of tight, contentious games in a row can significantly affect a team’s spirit ranking. There are still plenty of questions left unanswered about spirit scores in competitive play. Do these trends hold up in college divisions? What about in international play? 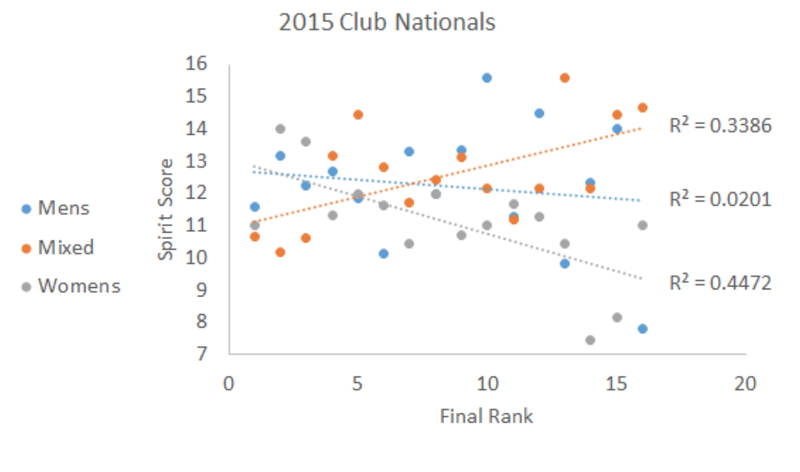 Do tight games drag spirit scores down, or do they give teams a chance to exhibit exceptional spirit? Do the spirit scores a team gives out reflect the spirit scores they receive? As on-field statistics and analytics improve, hopefully spirit analytics do as well. Comments on "Do the Nice Finish Last? Spirit Scores v. Performance"